Posterior insertional Achilles pain and retrocalcaneal exostosis pain are commonly grouped together as one common problem referred to as posterior insertional Achilles pain. However, these are two different problems with common approaches to treatment. Accordingly, let us take a closer look at retrocalcaneal pain and Achilles insertional pain, explain the different issues with each and their proper treatment options. When a patient presents with posterior heel pain, the most common diagnosis is retrocalcaneal exostosis. If a radiograph reveals a bone spur, the physician commonly tells the patient that the bone spur is the source of the pain. 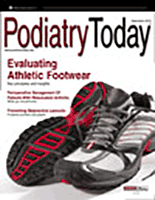 Twenty to 30 years ago, physicians tended to blame plantar fasciitis pain on a noted heel spur. Similarly, posterior heel pain is also blamed on the spur. In plantar fasciitis cases, we have come to realize that the spur is not the source of the pain and that the pain is due to a soft tissue inflammatory problem and scar tissue/fibrosis of the plantar fascia. This is also mostly true for retrocalcaneal issues. Commonly, the source of pain is inflammation of the Achilles at the insertion site and bursal inflammation at the calcaneal insertion site. However, as the spur enlarges, it may be a source of irritation with shoes and if the spur breaks loose from the posterior calcaneus, it can also be painful and irritating. What You Should Know About Pinpointing The Source Of Pain So how should one go about finding out the true source of a patient’s pain? The first key is to take a good history. Most cases of Achilles problems are associated with overtraining or increased activity resulting in overstrain of the tendon. Bursal inflammation is common with a sudden onset of pain, which improves with rest. Calcaneal exostosis/loose body pain is associated with shoewear and commonly grows worse over an extended period of time from months to many years. It is also exceptionally important to perform a physical exam. Pressure on the Achilles attachment will result in pain with any of the three aforementioned problems, namely Achilles problems, bursal inflammation and calcaneal exostosis. It is important to consider and test each problem separately in order to perform a complete exam. Bursal pain occurs at the most proximal heel projection and becomes worse with medial and lateral compression of the proximal heel without pressure on the Achilles. Achilles pain occurs along any part of the insertion but in tendinosis cases, there is usually scar formation and thickening of the tendon at the insertion site and more commonly just proximal to the insertion site. Exostosis pain may not be present if shoes are not pressing on the spur. An enlarged spur is not commonly painful unless the superficial tendon and soft tissue are being squeezed between the spur and the shoe. In cases of a loose spur, the pain mainly occurs at the distal Achilles insertion site on the posterior heel and direct posterior heel pressure results in pain. The best diagnostic tool is magnetic resonance imaging (MRI) of the ankle and posterior heel. Although ultrasound is also a great source of information, the amount of information one attains from MRI is significant and simple to unravel. The main point of ordering MRI is to see the quality of the tendon and surrounding soft tissue. One can also check for loose bodies within the attachment of the Achilles and bursal inflammation. It is important to remember that the combination of all three problems — those being Achilles tendonitis/tendinosis, calcaneal bursitis and calcaneal exostosis/loose body — may be contributing to the pain. Unless I can easily identify the problem, I will often get a MRI prior to starting treatment as treatment options vary according to my findings. Pertinent Pointers On Conservative Treatments In cases of bursal irritation, I have found excellent outcomes with non-steroidal, anti-inflammatory injections and rest. I will often use a combination of Traumeel (Heel, Inc.) and Arnica injected under ultrasound guidance in and around the bursal region. In very rare cases and if I am casting a patient, I may use a very short-acting steroid injection, placing this under ultrasound guidance into the bursa. In most cases, I will use a controlled ankle motion (CAM) walker boot and place a heel lift of ½ inch in the boot to take the strain off the Achilles and decrease the squeeze of the posterior bursa. Achilles insertional tendinosis has been the most difficult problem to treat. I have tried multiple treatment options including physical therapy, rest and surgery prior to coming up with what works for me. Physical therapy and rest are my first treatment options. Patients are allowed to swim or ride a stationary bike. During bike riding, the patient wears a boot to protect the tendon. Walking for short periods is allowed but not for exercise. The patient also wears an orthotic with a heel lift. If the problem continues, I may try an injection. In tendonitis cases that are associated with inflammation, I will often use an anti-inflammatory injection such as Arnica and Traumeel. Most cases of posterior Achilles insertional pain are associated with tendinosis and long periods of standing. In such cases, there is minimal inflammation and extensive scar tissue. For these patients, I will often turn to inflammatory treatments such as shockwave therapy, platelet rich plasma (PRP) injection, the Topaz procedure (Arthrocare Sports Medicine) or deep cross-fiber massage with dry needling. All of these treatments seem to work depending on the level of fibrosis and amount of inflammation. I have found multiple low intensity shockwave treatments very helpful in more minor cases and PRP injection to be helpful in moderate cases. In my experience, Topaz treatment is helpful in cases that may require surgical debridement but the patient would like to try one more conservative measure. Depending on the size of the spur, I will suggest surgical versus non-surgical treatment of the tendinosis issues. Emerging Insights On Surgical Options The spur formation on the posterior heel is often necessary to remove as it grows larger and also may break loose. No form of conservative treatment except for shoe modification seems to help in such cases. If there is extensive Achilles damage, one removes the damaged tendon and, in most cases, removes the posterior bursa. It is very important to remember what is causing the offensive pull on the posterior calcaneus. In many cases, it may be associated with an equinus deformity and this will require treatment at the time of surgery. My surgical options for posterior heel pain have dramatically improved in the past few years with the addition of stronger and better fixation techniques. Of greatest interest to me is the use of the Achilles SutureBridge™ (Arthrex) technique. While this technique was initially developed for rotator cuff repairs, it allows a knotless distal attachment of the Achilles and a very strong proximal anchoring of the Achilles after posterior calcaneal spur removal. To perform this technique, one would make a central posterior incision and split the tendon centrally, leaving the medial and lateral attachments. Remove all spurring, bursal projections and tendon damage. If extensive Achilles damage is present and additional strength on the posterior insertion is necessary, perform a flexor hallucis longus (FHL) tendon transfer from the same posterior approach with biotenodesis of the FHL to the posterior calcaneal insertion. This allows a decreased pull on the Achilles and the FHL transfer will take some of the stress from the Achilles. Reattach the Achilles by placing anatomic tension on the tendon at the attachment site. Finally, one should deal with any form of equinus, commonly through a gastrocnemius recession if necessary. Recovery from posterior calcaneal procedures differs with the procedure. In simple cases of spur removal and tendon reattachment, the fixation with the SutureBridge technique is so strong that I allow patients to bear weight at three weeks and begin physical therapy. At six weeks, the patient is out of the boot and beginning light exercise. If I perform a FHL transfer, I will begin therapy at two weeks but protect the patient in a non-weightbearing boot for four weeks to allow tendon ingrowth for a longer period of time. Total recovery time differs but ranges from two to three months. With the additional stability of the SutureBridge technique, there is less swelling and improved strength with decreased pain and a more rapid recovery time. In Conclusion It is essential to consider the differing causes of posterior heel pain and tailor your care according to your findings. Magnetic resonance imaging is the best source of information as to the underlying cause of pain and one should obtain MRI early on to properly understand the source of the pain. Conservative care needs to either address the lack of inflammation or treat inflammation, depending on the source of the pain. Surgical options require stable and rigid tendon repair with a possible flexor transfer in cases of severe tendon damage and weakness. Dr. Baravarian is an Assistant Clinical Professor at the UCLA School of Medicine. He is the Chief of Foot and Ankle Surgery at the Santa Monica UCLA Medical Center and Orthopedic Hospital, and is the Director of the University Foot and Ankle Institute in Los Angeles.